Model: HP ProLiant DL360p Gen8. RAM: 256GB DDR3 RAM. HDD: 4 x 3.5" (LFF) SAS/SATA Drive Bays (No Caddies/Blanks Included). All of our servers are refurbished to a very high standard. Internal parts (such as RAM and CPUs) are tested individually, and once the components are installed the system is tested in full. 16 x BL460CG7 BLADES. HP 10U C7000 CHASSIS. 2 x I/O Modules with KVM. 2 x 146GB SAS Drives. Tested by onsite technicians and in full working order. Slight signs of wear, overall good condition. Hard Drive: 8x 146GB, 15,000RPM (with caddies). Product Form Factor: Rack-mountable - 4U. Model: HP ProLiant DL360p Gen8. RAM: 256GB DDR3 RAM. HDD: 4 x 3.5" (LFF) SAS/SATA Drive Bays (No Caddies/Blanks Included). Form Factor: Rack-Mountable 1U. All of our servers are refurbished to a very high standard. Tested by onsite technicians and in full working order. Light wear, overall very good condition. RAM: 16x 16GB DDR3 - P/N: 672612-081U. Form Factor: Rack-Mountable 2U. HP FlexFabric 554FLB Dual Port 10GB Network Card. HP Proliant BL460C G8 Including HP Proliant BL460C G8 2 x 2.5" Blade Chassis. 8GB DDR3 RAM. 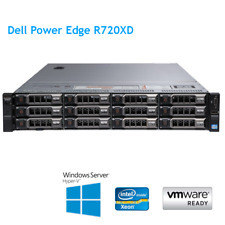 Dell PowerEdge is a trademark of Dell Inc. HP is a trademark of HP Inc.
Model: HP ProLiant DL380p Gen8 25x Bay. RAM: 256GB DDR3 RAM. All of our servers are refurbished to a very high standard. Internal parts (such as RAM and CPUs) are tested individually, and once the components are installed the system is tested in full. Dell PowerEdge M620 Including 256GB DDR3 RAM. 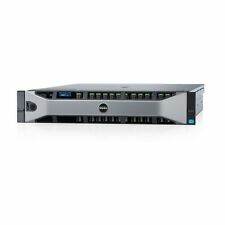 Dell PowerEdge is a trademark of Dell Inc. HP is a trademark of HP Inc. PowerEdge is a trademark of Dell Inc.
HP Proliant DL360 G5. HP Proliant DL360 G6. HP Proliant DL360 G7. HP ProLiant DL360e Gen8 - Max Turbo Frequency 2.30 GHz. 96GB DDR3 Installed. HP Proliant Servers. HP Proliant DL380 G5. HP Proliant DL380 G4. CPU: AMD 6274 x 4, 2.20GHz Max turbo 3.10Ghz, 16 core. Model: HP DL585 G7. P410i Raid Card with 1GB Cache plus battery. Storage: 8 x 146GB HDD SAS 10K. Fully tested and working 100%. Buy it Now! 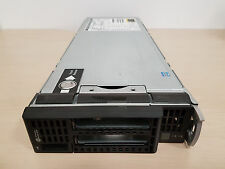 Model: HP ProLiant DL380p Gen8 25x Bay. RAM: 256GB DDR3 RAM. Form Factor: Rack-Mountable 2U. Rails: Rack Rails Not Included. RAID: HP Smart Array P420 1GB FBWC. HDD: 25 x 2.5" (SFF) SAS/SATA Drive Bays (No Caddies/Blanks Included). Dell PERC H710 Mini. 2 x 300GB 10K SAS 2.5" Hard Drives. 256 GB ECC DDR3 1600 MHz Ram. Location: Demo Room. DELL PowerEdge C6100 including 4 x XS23-TY3 Nodes. All 8 x Processors (2 x CPU Per Node) installed ( 48 CPU Cores/ Logical Processors/96threads). Backplane: 1x 12 Bay 3.5” LFF SATA (takes up to 12 x SATA drives - 3 x SATA for each Node). The PowerEdge M710HD blade server fits in the PowerEdge M1000e blade enclosure. A total 16 half-height blades can fit into every M1000e enclosure. Full-height and half-height blades can be mixed in M1000e enclosures with no limitations. HP C7000 Enclosure 16x BL460C Blade servers. 128 x 2.66GHz CPU Cores, 256GB RAM. C7000 Enclosure - each Blade Server is BL460c G1(2SFF) E5430 2.66GHz QC(2P). 256GB RAM (16GB per Blade), 4672GB Disk Space (2x146GB per Blade). IBM HS23 7875 Blade. 256GB RAM (16x 16GB 49Y1528 ). 10Gb LOM interposer card 81Y9388. 2x E5-2620 2GHz 6C CPUs. Credit or Debit Card accepted Worldwide. 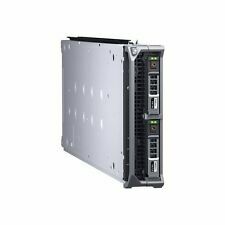 Dell T620 / 2 x Xeon 8 Core E5-2650 v2 2.6GHz / 128 GB / 6x300Gb SAS 15K 3.5"